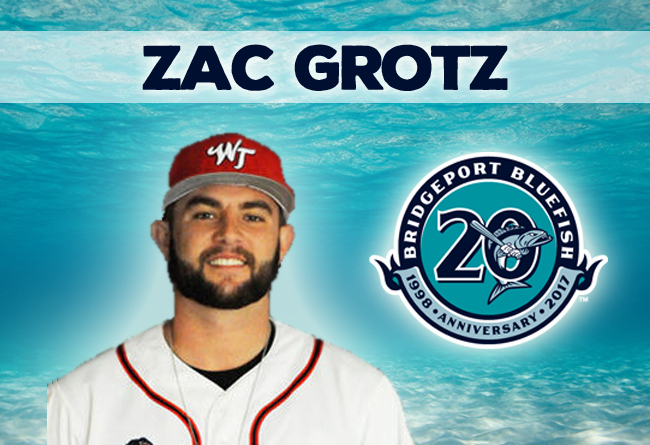 (Bridgeport, Conn., Feb. 14, 2017) – The Bridgeport Bluefish today announced that pitcher Zac Grotz has been acquired in a trade with the Washington Wild Things of the Frontier League for a player to be named later. Zac Grotz joins the Bluefish for his first season in the Atlantic League and third of professional baseball. Last year, the pitcher split time between Rookie-level Ogden (Los Angeles Dodgers) of the Pioneer League and Washington of the independent Frontier League. In 34 total mound appearances, he earned eight victories and collected a 1.12 ERA with 62 strikeouts in 64.1 innings of work. The 23-year-old made his professional debut in 2015 after being selected by the Houston Astros in the 28th round of the MLB draft. He reached the Low-A level in his debut year before being traded to the Dodgers organization the following year. In 53 career minor league appearances, Zac owns a 13-5 record with a 1.67 ERA and 77 strikeouts in 86.1 innings of work.